Ubisoft has shown Assassin's Creed Origins for the first time during Microsoft's press conference. Here is the trailer, with the gameplay in a few hours hopefully. Thanks a lot for this trailer! The trailer itself is bad because it didn't show almost anything of the new, improved and changes from the core gameplay systems that the Game Informer coverage detailed. For example, Assassin's Creed: Origins is an Action-RPG game now, instead of an Action-Adventure game. 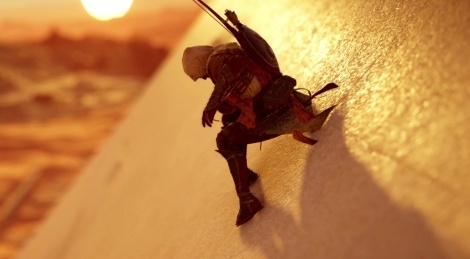 Or how you can't kill people instantly if you're even at a measly 3 levels lower than the target, like Bayek at level 20 trying to assassinate a level 23 enemy. Or how you can now climb everything, just like in The Legend of Zelda: Breath of the Wild. Anyway, not gonna write everything that was mentioned on Game Infomer. But this trailer didn't make the game look like it improved on almost everything upon previous games. Which is a bad trailer, considering how many things have changed. PS. This seems to be becoming a trend with Ubisoft games. 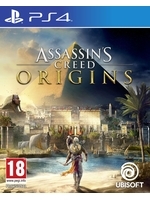 First Far Cry 5, and now Assassin's Creed: Origins. What you read elsewhere does a far, far better job of exciting you than watching the game's trailer itself. I used to almost always love Ubisoft's games' trailers, but these two are very dull ones, unfortunately. Agreed that the trailer was quite bad. The leaks had more info on the game and the gameplay I watched on EasyAllies was more fun than this. Wish they'd release it soon. Don't like the 'track through walls' shtick but the combat could be more fun this time around. I have to say, I didn't enjoy Syndicate at all, the game was too easy. Franchise is dead, they need to just let go. Dead just like BioWare, right?! lets wait to see if anthem is actually good before we proclaim it as a good game, shall we?